Randy blows snow off our driveway following a February 2014 storm. This winter has been similar in snow and cold to that of four years ago. Minnesota Prairie Roots file photo February 2014. 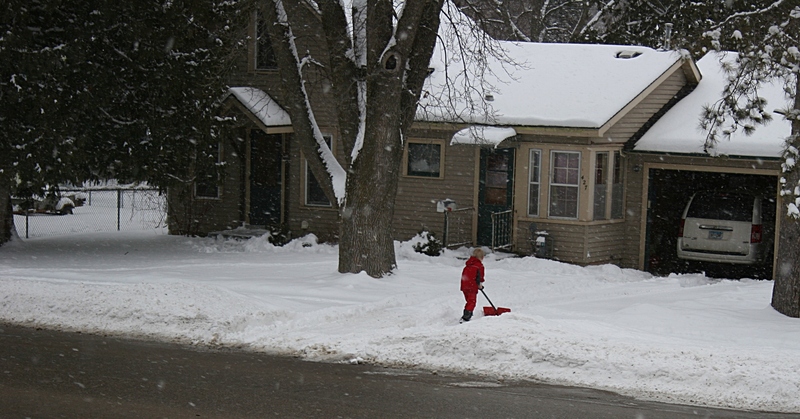 IF RESIDENTIAL SNOW REMOVAL in Minnesota involved simply clearing driveways and sidewalks, our work would be easier. In this image, you can see the depth of snow on the roof. But when snow accumulates and no January thaw arrives to reduce the snow pack, we start thinking about problems like too much snow on roofs and those damaging ice dams. Sunday afternoon, after our most recent 4-inch snowfall the day prior, Randy pulled out the ladder and climbed to the flatter section of our house roof. He had about 18 inches of accumulated snow to scoop and toss from roof to ground. After awhile, he was working up a sweat in the bright sunshine. Just inside the kitchen, I watched him labor. I’ll shovel snow, but only if it’s on the ground. 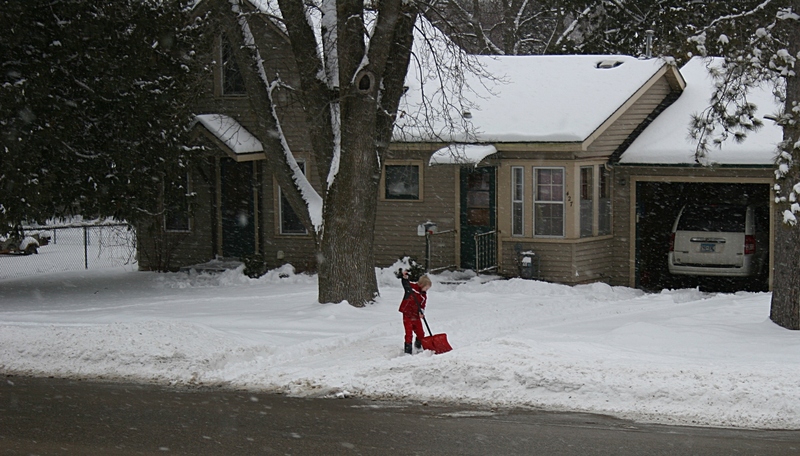 My job was to monitor my husband, to see that he stayed safe and didn’t overdo the shoveling. Now that we’re in our sixties, I tend to think more about how shoveling can cause heart attacks and back issues. And then there is that slipping and falling off the roof factor to consider. Randy seems mostly to ignore my concerns. I wish he wouldn’t. Randy guides our ancient snowblower along the driveway following a late January snowfall of about 15 inches. Minnesota Prairie Roots file photo January 2018. With the sun shining and temps rising into the balmy forty-ish range this week, all of Randy’s rooftop shoveling paid off with shingles now visible and ice dams melting. We’re good until more snow stacks and temps plunge. Next week. TELL ME: If you live in a snowy state like Minnesota, how do you handle snow on the roof and ice dams? If you don’t have to deal with these issues, feel free to comment anyway. About to begin shoveling the driveway. “HOW MUCH SNOW did we get?” I asked my husband upon arising Friday morning. I had no desire to bundle up and head outdoors to shovel the sidewalk and driveway. Again. He guessed about five inches. And so I felt a tinge of guilt, making the mail carrier and the few pedestrians in my neighborhood plow through the snow. But at least school wasn’t in session and kids wouldn’t be trudging through the snow, too, packing it down. The first scoop of snow. But then, around 2 p.m., the next door neighbor barreled down the sidewalk with his snowblower blazing a trail past our house and then back a second time to clear an even wider path. That Ken did this simply out of the goodness of his heart pleases me. Up the street, a kindly soul opened the driveway and sidewalks of another neighbor whose property my husband typically clears of snow. 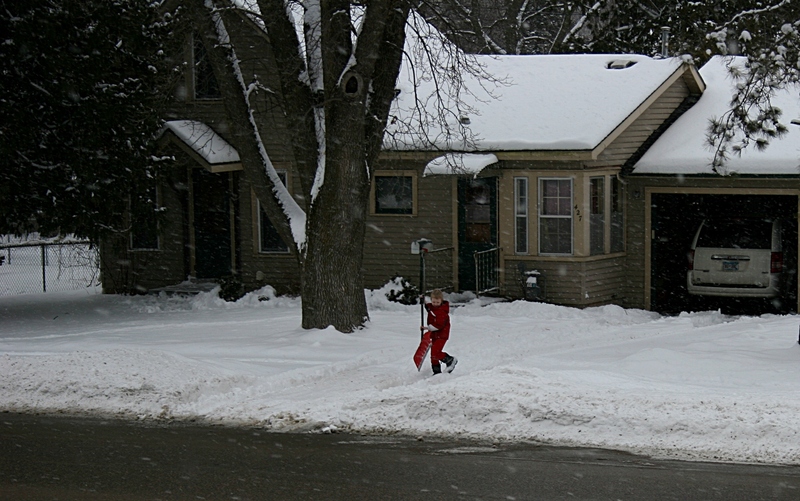 Across the street, the neighbor boy attempted to clear the driveway, a seemingly insurmountable job for the little guy. He was giving it his all, for awhile, clearing only a small section before abandoning the task. Perhaps someday he’ll blaze a trail through the snow with a snowblower. Or maybe he’ll just give up and move to Florida. I’VE JUST COME in from shoveling snow. Nearly 1 ½ hours of scrape and lift and throw. Or bend and scoop and carry and throw. I could have waited for my husband to do this after work. But he works hard all day and tonight he will have about 45 minutes to eat and shower before leaving for a church meeting. Honestly, who schedules a meeting during Christmas week? But that is another topic for another day. Today I am focusing on the snow which the city plow scraped from the street and deposited at the end of our driveway and sidewalk. This would be boulder-sized chunks of compacted snow seasoned with salt and sand. As I labored to clear away the mounds of snow, I grunted and sighed. My back ached. My right hip hurt from the stooping and twisting. When I stopped occasionally to lean against the scoop shovel handle, I breathed in deeply. Then I forged onward, determined that this snow would not get the best of me. Soon I was sweating. Even my hands. I unbuttoned by wool pea coat. I carried more shovels full of snow boulders up the slight incline of the driveway apron. I heaved the snow chunks onto the snow along the sides of the driveway because I could no longer toss it atop the roadside mountains. Finally, I finished…then realized I also needed to open the sidewalk. When I saw that mountain of snow before me, I nearly gave up and walked away. But, instead, I dug in, determined. Scoop, carry, throw. Scoop, carry, throw. Scoop, carry, throw. Soon I removed my coat and tossed it atop the snow. Still sweating, I also ditched my stocking cap. AND THIS IS ONLY THE SECOND DAY OF WINTER? WHY WAS SNOW SO MUCH MORE FUN WHEN I WAS A KID? Then, when I finished, I stashed the shovels in the garage, snapped some photos of the major ice dams and icicles hanging from our house (another job for another day) and tossed down three hands full of chocolate chips. After all that shoveling, I deserved some chocolate. WHAT WOULD YOU WRITE on that snow sign I contemplated posting in my yard? How do you reward yourself after shoveling snow? With chocolate, like me? And, finally, my apologies to my brother-in-law Neil, who just returned from Iraq. He told me I was blogging (complaining) too much about the snow. He’s in Hawaii right now. Enough said.